If you enjoy a good detective series, there’s none better than Vera, which premieres on MPT this coming Friday. 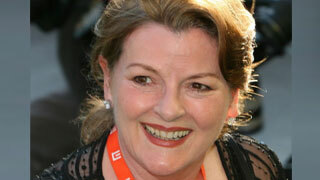 Like the character she plays, DCI Vera Stanhope, Brenda Blethyn has working class roots. She was the youngest and only daughter of nine children, whose parents had met while both working in an “upstairs downstairs” type of household. Her mother as a maid and her father as the family’s chauffeur. Blethyn didn’t get started in the acting business until she was in her 30s and her television and film career didn’t really kick-in until she was in her 40s. It was only after her divorce from her first husband in 1973 at the age of 27 that she left her office job to study at the Guildford School of Acting. Three years later she went straight onto the London stage, where she worked for several seasons at the National Theatre, which is where her second husband, Michael Mayhew, who is now retired, also worked as an art director. 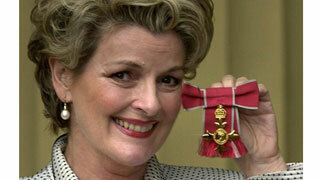 Blethyn with her OBE award. Blethyn and Mayhew have been together for almost four decades. Only recently though did they get married. 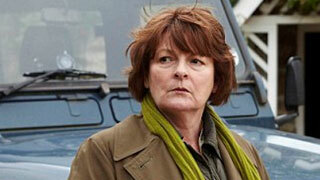 Mayhew proposed to Blethyn via Skype when she was filming the first series of Vera in 2011. The wedding was an extremely low key affair, taking place in a London Register Office with only actor Timothy Spall and his wife as witnesses. Both Spall and Blethyn credit their career success to the director Mike Leigh. Blethyn first worked with Leigh when she made her television debut in a BBC televised play in 1980. Since then he has directed her in numerous projects, including the film that garnered Blethyn her first Oscar Nomination, Secrets & Lies. Her second nomination was for the film Little Voice. Other films you might have seen Blethyn in are Atonement, The Witches, A River Runs Through It and one of her most popular films, Pride & Prejudice, where she played Mrs. Bennet. Although born in Kent in the south of England, Blethyn does a very good job of portraying the down-to-earth northerner, Vera Stanhope. In an interview the actress gave with The Telegraph, she credited her character’s no-nonsense approach and eccentric wardrobe to a bargain basement pair of boots she bought 20 years ago for £12 in a sale in Birmingham. “I remember thinking, 'They’ll come in really handy one day. '”, said Blethyn. “They’re the ones I wear now as Vera. They sum her up well; they’re practical, no-nonsense, easy to put on and kick off." 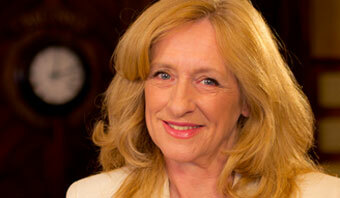 Vera airs Friday nights at 8pm on MPT.